In case you didn’t watch the video (or you did – but didn’t get it) The point is that he doesn’t actually come right out and tell you. Instead the short 3 minute video gives you a humorous montage of misinformation. Meaning that it’s an art, rather than an exact science to getting page one rankings. Although there are specific things we can do to give our page a boost in terms of rankings and some things that we need to avoid in order not to be penalized. Google won’t reveal their exact ‘secret’ to getting on page one Or ‘How to Get First Page on Google’. So it comes down to doing your own research, even using the process of trial and error in order to develop a strategy that works for you. Fortunately I have been able to achieve just such a strategy and I will share it with you. After many years and a dozen sites not ranking at all… I now have a site that has more than twenty page one & two rankings on Google. The above screen shot shows five, position 1‘s on Page One of Google and two at position 2 on Page One. (So that’s seven page one’s so far). The next screen shot below shows another six more page one rankings and two, page two rankings, all for the same website but for different pages and posts. – (That’s thirteen page one rankings). The next screen shot below shows eight more page two rankings for the same website but for other pages and posts. Demonstrating the value of having plenty of great content on your site. This is important because it allows you to get multiple rankings for the same website as you have seen in the above screen shots. This also shows that getting every page and post on page one is not realistic and that page one ranking on Google is still an art rather than an exact science. However all-in-all that’s a total of twenty three posts and pages on the first two pages of Google for this particular website. Many people would be excited just to have one page, ranking on page one or two of Google. Really there is no magic. 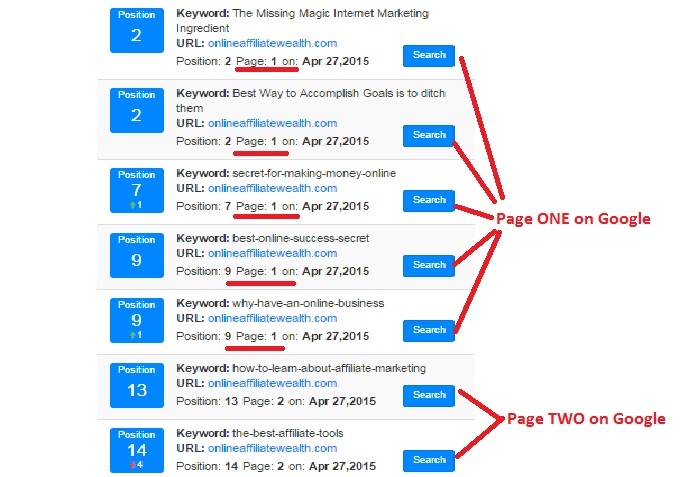 I got an education from Wealthy Affiliate and I just utilize an awesome keyword research tool called Jaxxy and with this tool I can see the competition for the specific keywords and how well it will rank in Google. I then select that keyword phrase and write content around the keyword phrase knowing that it will rank well. Now understand that if I can do this, then so can you, once you have access to this awesome keyword research tool. Finding Keywords that gets traffic is important. However what’s even more important is finding keywords that has low competition that will also get you ranked in Google. 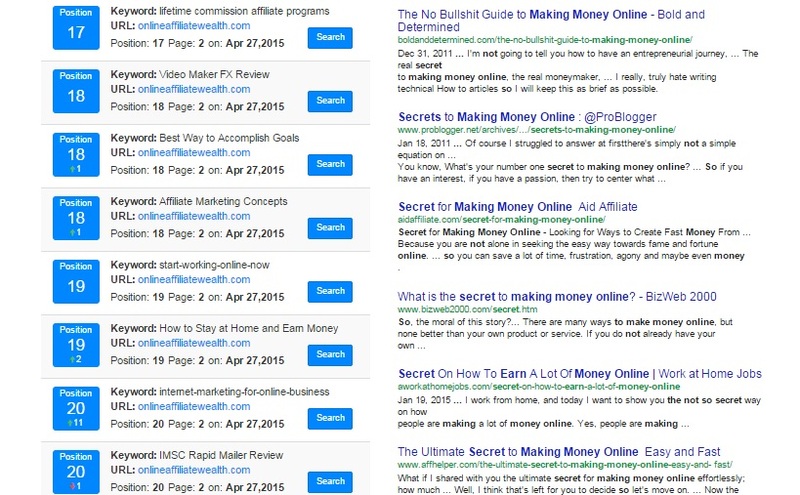 Getting ranked in Google is what will bring you free targeted traffic. Having a page one ranking will on average bring you 42%of the traffic. To see more about this amazing Keyword Research tool I have a few other posts that you can access from here; What’s the Best Keyword Tool? and the Best SEO Keyword Tool. Both will give you more information about Jaxxy, how to use it and what makes it so good. Just because you have great keywords you still need to be clever about how you use them You can’t just load up your article with keywords and expect it to rank. Google are on to that these days. Now it’s time to find the traffic generating keywords. Take a look around at the suggested posts and if you want to learn more about this amazing Keyword Research tool and get a free trial you can do so here Jaxxy. Now understand that I don’t always get page one or two, sometimes I only get on page three, four, five and so on because as I said it’s an art rather than an exact science. However rankings on the first 10 pages are better than not ranking at all. Usually over time with a little tweaking you can make your pages move up in the rankings. In fact time is a rankings factor so it’s not always possible (although it does happen) to get page one when you first publish your article or page. But with the right education and tools you can usually manage to rank pretty well. Below is a screen shot of this exact page rankings a few hours after this post was first published. I hit page three straight away in front of 1.3 Billion results. I expect it to move up from there given a little time and engagement from people leaving comments. To discover how you can also do this read some of the other posts on this site. If you are new to internet marketing and would like more information pick up a copy of my free ebook see the bottom of this page. “Also if you are little unsure how to go about making money online, you can see a great post by a friend of mine, A Guide To Making Money Online In 10 Easy Steps, Yunier has some very good pointers in this post, so take a look. 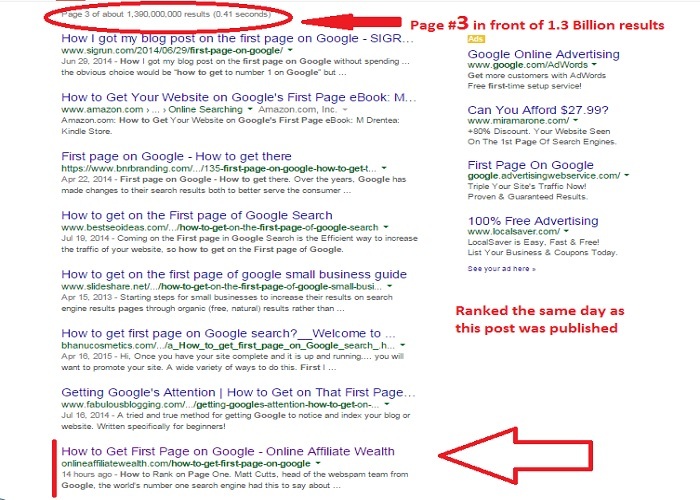 If you enjoyed this article “How to Get First Page on Google” please feel free to socially share and leave a comment below. 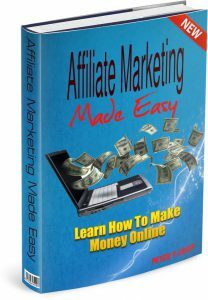 And if you do I will reward you with a free copy of my 40+ page ebook; Affiliate Marketing Made Easy. Thanks for a thorough post on a very important topic. I see you use the best keyword tool . I hope to get better and better at using this tool in order to get the same results you mentioned here. I will be back at your site as I see you have so many useful resources. Hi Peter, me again. I just keep coming back to your website looking for answers. I shared your page but can’t seem too see how I can get your ebook for free. Can you help me out here please. I am looking forward to grabbing it and have a good read. This is good information to add to the arsenal for sure. The only thing I’m going to add here is, it goes back to that old saying,” you can lead a horse to water but you can’t make him drink”. You can have the best information in the world, but if the person doesn’t have the gumption to absorb it, it won’t help. The point is, if you’re trying to make money online, hopefully people can take this useful info and try to actually understand what it’s saying. Good read. Great article. I would love my web page to be on page one. I do appreciate your thorough research and practical information. Your blog is great and your information is practical. I do appreciate you writing this. I will keep this in mind and pass it along to a friend as well. Very good, well laid out blog post and video. SEO gets over complicated by half the internet aand really you just need to know a couple of basics, avoid blackhat habits and you can really be an effective competitor in your niche. Thanks for this great outline and its good to see more people putting instruction into video format too.! Most impressed with this post! You’ve made the topic of keywords very understandable and easy to follow! I love the video from Google explaining why keyword stuffing is not a great idea and I love the fact that the tool you recommend is Jaaxy. I’ve been using it for a while myself now, and it’s invaluable to me and my business too! Thanks for the input – it’s clear, concise and has given me an awful lot to think about! Hello, Maite. I am pleased you have enjoyed the post and found it informative. Happy to know you are already part of WA as it is a great place to get the knowledge and education to build a successful online business. thats a solid post on getting your page to be ranked in google, i now know that keyword is important and a tweak will help on the rank. 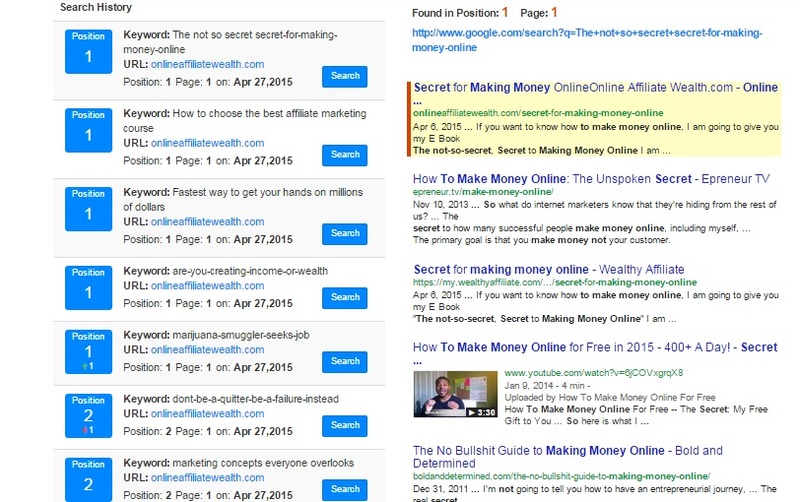 I noticed that in wealthy affiliate there’s a keyword search tools as well right ? and is it enough compared to jaaxy ? or we have to use both ?